Omega in dog food - Is your dog getting enough omega from his diet? It does not matter what we feed our dogs. We are always worried that they are not getting all the nutrients they need from their diet… or getting too much. One common worry is if they are getting enough omega from their diet. Is there enough omega in their diet? And how can we make sure our dogs get the right balance of fatty acids from their diet? These are the core canine dietary requirements. The ingredients in commercial dog food should be based on these requirements. Many do but there are also many nutritionally lacking commercial dog food brands around. This is why dog owners need to know how to read labels, i.e. to make sure their dogs get all the nutrients they need and in the right balance. This can though be easier said than done. This is why dog owners are increasingly feeding their dog's raw or homemade diet. They feel that way they can better control what is in their dogs’ diet. Homemade dog food should contain at least 75% animal-based ingredients. This includes meat, organs, dairy products (cheese, yogurt, cottage cheese), and eggs. As well as fatty fish (for the important DHA and EPA fatty acids), like salmon, mackerel, herring, and sardines. Your dog needs bones as they contain nutrients that are vital for their health. Bones contain minerals like calcium and phosphorous, protein with essential amino acids, fat-soluble vitamins like A, D and E, essential fatty acids, and the marrow contains blood-forming nutrients like iron and copper. What's more, bones keep your dog’s teeth's clean and the gums healthy. The remaining ingredients (up to 25%) should come from plant-based ingredients, i.e. to get the needed fibre, vitamins, and minerals. Good vegetables for dogs include leafy vegetables like broccoli, cauliflower, spinach, and kale, as well as root vegetables like carrots, turnips, and parsnips. Onions and garlic are off limits as they can cause damage to the red blood cells. Wild mushrooms and rhubarb can also be toxic for dogs. Fresh and dried fruits are good source of vitamins and minerals, but no grapes or raisins as they are potentially toxic for dogs. While citrus fruits (like lemons, limes and grapefruit) can cause stomach upset. And for the essential omega 6, your dog needs sunflower, soybean or safflower oil. You can find lot of information on-line about homemade dog food, whether it is cooked or raw dog diet you are interested in. The Raw Food Vets offers good overview of what raw dog food diet is all about, plus offers quality links to other informative websites and professional bodies. But what about the omega fatty acids? Is enough omega in dog food? It can be difficult to ensure that your dog gets the right balance of fatty acids in his diet. Commercial dog food tends to include the essential fatty acid Omega 6 (because essential means the dog must get it from his food). However, the amount and / or the quality may be insufficient (commercial dog food loses lot of nutrients during processing). What's more, few commercial foods include the right balance of omega 3 and 6. Omega 3 has anti-inflammatory properties and as such offers various health benefits for dogs. This is why most dogs on commercial dog food can benefit from omega oil supplementation. It can also be tricky to get the balance right when preparing your dog’s meals yourself. Dogs on homemade diet can also benefit from good quality fatty acid formula for dogs. Giving your dog sunflower, soybean or safflower oil will provide him with the essential omega 6 fatty acids. While the best omega 3 foods are fatty fish (or fish oil), like menhaden, tuna, or sardines. However, you must get the ratio between foods high in omega 3 and 6 right. And if you increase the level of DHA and EPA fatty acids (found in fish oil) then the body uses up its reserves of omega 9. Meaning you may need to supplement for omega 9… so maybe not so straightforward after all. We feed our dog's homemade diet. The core of their diet is minced chicken or beef mixed with wide range of vegetables (broccoli, cauliflower, carrot, parsnip, kale, butternut, sweet potato, etc.) and some brown rice. They get some fruit as well (actually, it can be funny to watch them eat fruits. It takes Tess longer to eat one blueberry than cutlet bone). Then we feed them on regular basis liver and other ovals, raw bones, eggs and some dairy products. And before we started using maxxiomega we tried mincing fatty fish, i.e. mackerel and herring. Believe us, it was not nice. Not only does it look vile, the smell is awful… and it lingers. So we gave up and gave them boiled salmon instead once in a while. It's though not cheap and we were concerned that they were not getting enough omega from their diet. And we think we were right to be worried. We see great difference in their coat since we started giving them maxxiomega oil for dogs on daily basis. We still give them salmon once in a while as a special treat, but we feel better knowing they get all the fatty acids they need, and in the right balance, by just adding couple of squirts of maxxiomega oil over their meals on daily basis. So dogs on homemade diet can also benefit from good quality fatty acid formula for dogs. And the dog owner benefits too. Good quality omega oil for dogs, like maxxiomega, is easy and practical way to make sure your beloved dog gets the right balance of fatty acids for his needs. Because maxxiomega not only contains high quality omega 3 and 6, it also contains omega 9. Omega 9 is often underestimated but it plays an important role in the body. It helps control the blood sugar and lower "bad" cholesterol and raise the "good" one. 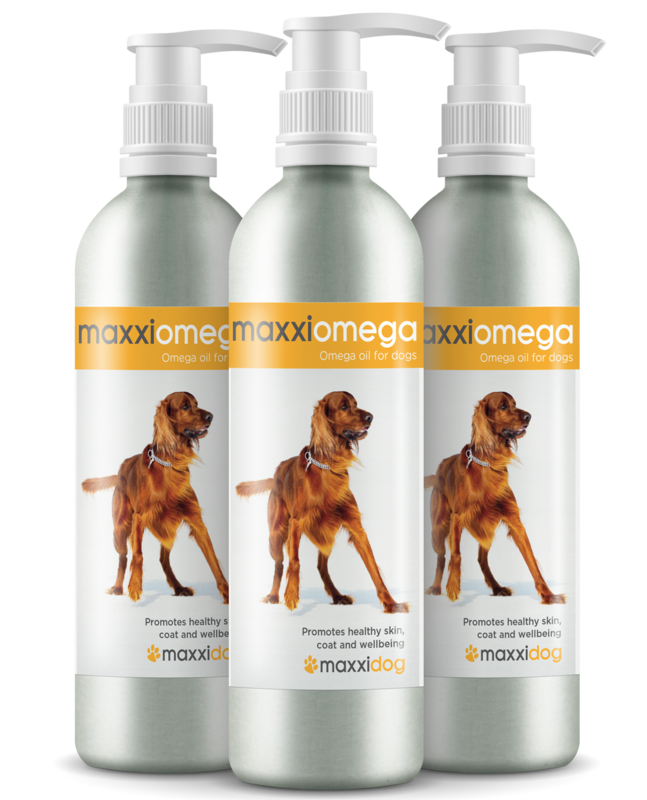 maxxiomega oil for dogs is a great way to ensure there are enough fatty acids in your dog's diet.